I love that last pic, looks delicious. I've never had these tiny plums before. Mmmmm! that recipe looks very good. The hedge along my veg garden is laden with wild plums (or bullaces) - very similar to your mirabelles (probably just the french name for a very similar fruit). 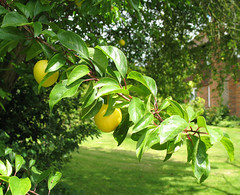 The fruit on our trees have a pinky/red colour when ripe. 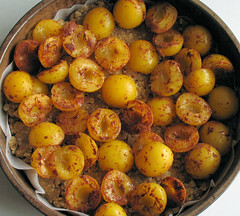 Will give this recipe a try when our bullaces get ripe. And it will probably work well with my favourite fruit - the Cambridge Gage. What a cool discovery! Lucky you! Brilynn - although I did try some last year, I didn't really know what they were! 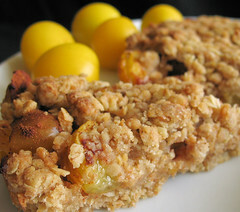 You can make that recipe with ordinary plums or other fruits even. Celia - your wild plums sound interesting too! Unfortunately I don't have enough to make anything else this year, hopefully there will be more next year. Joe - Hi there - thanks for visiting! You can tell I was quite excited by them!! Whew, finally I can leave a comment! 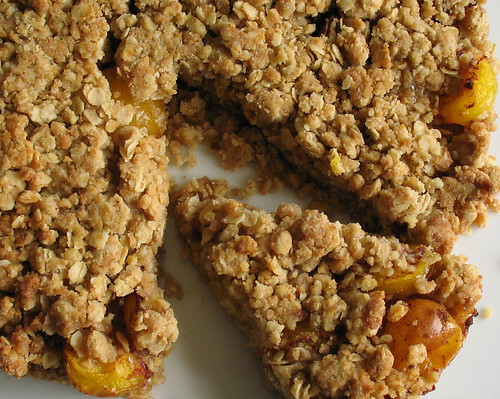 Your crumble looks absolutely delicious! I feel as if I could just dig in, now pass the cream! What a lucky girl you are to have such a tree in your garden! This is a fab blog. I'm glad to see more uses for the mirabelles. We have a couple of trees in our house and I'm constantly looking foro things to do with them, especially in a glut year. 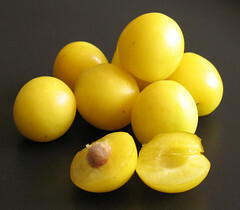 I've posted the most amazing mirabelle liqueur on my blog, Nonna's Cooking, http://nonnasrecipes.blogspot.com/ if you want to have more ideas for ways to use them.